Mary holds an MA (Hons) in English Literature from the University of Glasgow, an MPhil in Publishing Studies from the University of Stirling and a PhD in Television History from Glasgow Caledonian University. Subsequently, she has worked as a teaching fellow at the University of Stirling, a research fellow at University College London, and most recently as a research fellow at the University of Warwick on the AHRC project ‘A History of Television for Women in Britain, 1947-1989’. 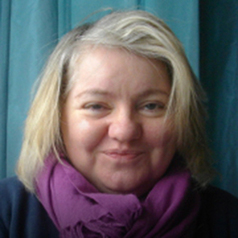 She joined Northumbria in September 2013 where she is a senior lecturer in Media. She specialises in the broad area of television studies, with specific expertise and interests in British television and film history, television drama, television comedy and documentary television and feminist television studies. She has substantial experience in moving image archival research both practice and theory. She has published her research in a wide range of journals from Screen, Feminist Media Studies and Media History to The Journal of British Cinema and Television and Critical Studies in Television. She has contributed chapters to a number of edited collections on television. She is also a peer reviewer for Critical Studies in Television.